One of my favorite woods to work with, and look at, is tiger maple. I don’t differentiate between “curly” and “tiger” when it comes to maple, as long as it’s striped and captivating. But what is it about curly maple that draws not only my attention, but the interest of woodworkers (and wood appreciators) everywhere? The figure obviously. Un-figured maple is rather boring – in fact, many domestic hardwoods are. When you throw finish on it the grain pattern almost completely disappears. But when that mystical curl happens in the tree the boards just seem to come to life with unmatched depth and vibrance. You’re probably aware that wood comes from trees and, as a natural product, it isn’t uniform, consistent or homogeneous (to be repetitive and redundant).With A&J Tree Service you can have a tree cutting and removal service to get the required wood and make your art, virtually any wood can curl. 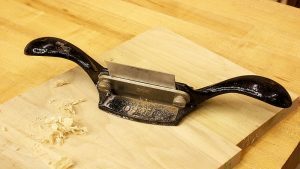 The curl itself is proof of concept that wood is an inconsistent medium, with areas of more and less densely packed fibers. Tiger (or curly) maple adds a little more uniform structure to that bit of natural chaos than some other woods. But what is curl and how does it happen? The simple answer to how it happens is, no one knows for certain. Some believe it to be something in the soil, while others believe it to be a byproduct of stress from wind and weather. If either of those theories were true, then there would be groves of tiger maple trees. The reality is, you might walk into a forest and find one maple tree in a hundred that is curly, or you might find fifty – there’s no consistency. The theory I believe makes the most sense is that curl is genetic. Think of it as being analogous to curly hair in humans, only rarer. The progeny of a single tiger maple tree might rarely be curly. However, the occurrence might dramatically increase if the gene was dominant (say, in the case of offspring from two tiger maple trees). In order to answer the question, “What is curl?” you have to envision the wood fibers undulating in a wave pattern. The shorter the wave length (distance between two peeks of the wave), the closer the stripes: The greater the amplitude (the distance from the peek of a wave to the bottom of the valley), the more intense the individual curls. 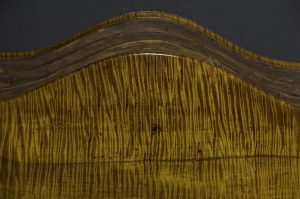 As the log is sawn into boards a higher amplitude means curly fibers will be closer to perpendicular to the board’s surface making the figure more intense. As you might guess working tiger maple can be as inconsistent as the wood itself. Intensity of curl isn’t always an indicator of how difficult the material will work with edged tools. I’ve worked highly figured boards and left a glass smooth surface, and others of moderate figure where sanding would have caused tear out. There seems to be little rhyme or reason. I primarily work soft curly maple because hard maple is, well, hard. Soft tiger maple (wood that comes from softer maple trees like the red maple) tends to take color and finish better than rock (hard) maple. And if I’m working highly figured soft maple, I tend to resort to my cabinet scraper for surface prep followed by a bit of random-orbit sanding. The scraper usually leaves a fairly smooth surface, but the sander equalizes any variations. 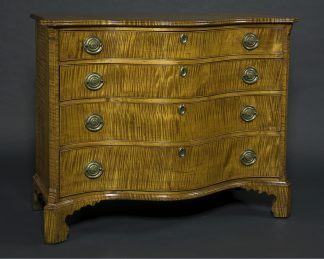 For centuries tiger maple has been used decoratively in furniture. 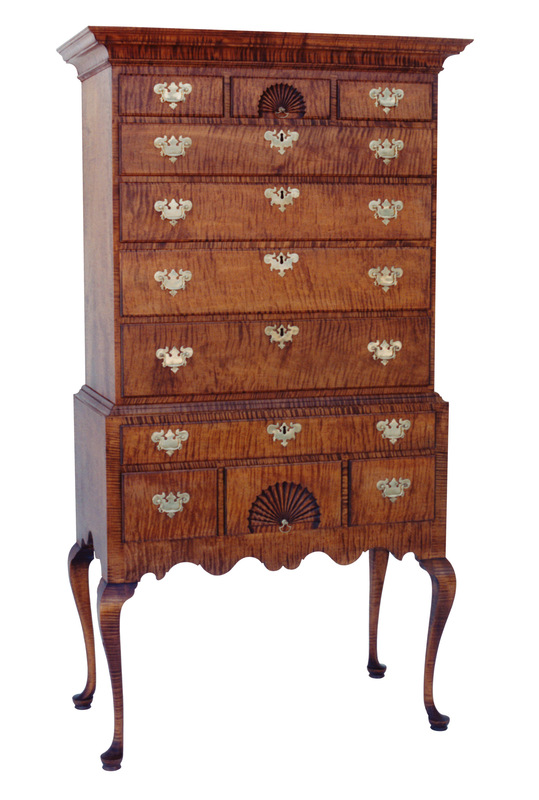 In the 18th century it was often stained, or dyed, a dark reddish brown in order to simulate figured mahogany. 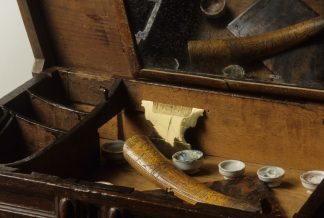 Many of the period pieces seen today have a color and patina that is a direct result of that original coloring. Over the years, as the piece was polished and refinished, the color faded to what is now a deep, dark amber with light brown stripes. 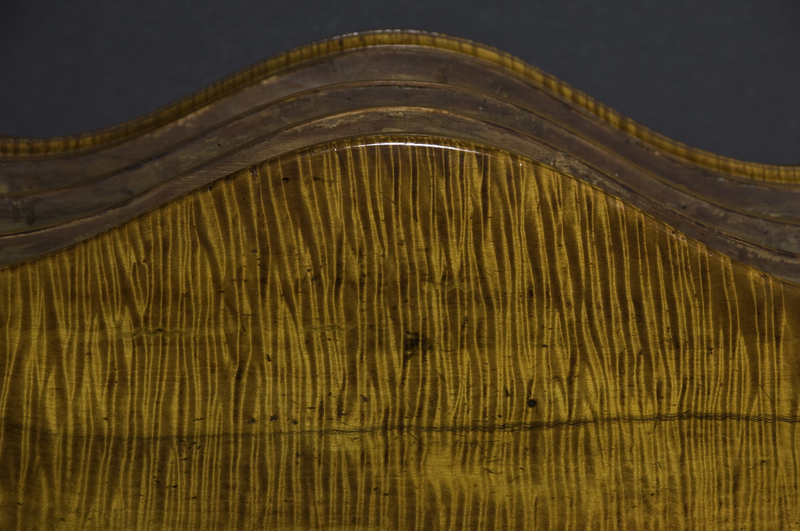 In addition to furniture, tiger maple was often used in the stocks of Kentucky rifles. The gunsmiths used a ferrous nitrate solution to give the wood that deep amber color with chocolate brown stripes. I’m not entirely sure that method didn’t spill over into the furniture trade. Regardless of how you finish it tiger maple remains one of my favorite woods to work because each piece is different in appearance. It’s always a challenge to work it, and compose the figure to bring maximum effect while keeping the appearance of balance. Add some curly, or tiger maple to your next project you’ll be glad you did. Check out the Massachusetts Serpentine Chest Class I’ve got scheduled for August, 2019 to see some pretty spectacular tiger maple. Make sure to hover over the photos to make the figure come alive or, better yet, sign up and make one of your own. Chuck, what finishing steps do you use to bring out the tiger maple? I am building a kitchen dining table with tiger maple. I have made some sample boards with different finishes. I am still undecided. I lean towards an oil finish first, e.g. boiled linseed, followed by amber shellac and wipe on polyurethane. Is this anything like the steps that you use? My coloring process for tiger maple uses both custom-mixed dyes and stains. The dye is applied first to give a background color, then the oil stain goes on to deepen the color of the stripes. I tend to topcoat with shellac. If you use boiled linseed oil, make sure you give it plenty of time to dry before top coating with shellac and poly. I don’t use poly because I don’t like the plastic appearance. I tend to use true varnish with no urethane added because it looks more natural to me. It is, however, getting harder to find real varnish (try marine supply houses like jamestownsupply.com). Usually I mix the varnish with tung oil to get deeper penetration from the oil (which makes the striped appear deeper and richer), while getting better build from the varnish than you would get solely from the oil. But all of that goes on top of the color layers previously described. Let me know if you have any other questions.